Can you believe Mason is already 14 months old, I swear time just flies! Ever since I became a mother and even during pregnancy I have bought more stuff for mason than I have for myself, and that's to be expected right? I am always on the look out for the safest car seats (which we are currently looking for ), softest blankets, shoes that will last him a while since mason loves playing in the dirt, but also finding new toys that are with his age and help him grow and development but still be the perfect toy for entertainment! Even though toys are made to play with, its a double win if the toy provide educational features to it! Our babies minds are always growing and its our job as parents to keep them actively engaged that can help them figure things out, learn patterns, and see results by doing something. I don't think there's ever been a trip where we haven't brought a toy with us, especially now that he is a toddler, if its a long road trip or a flight we make sure to bring one that can keep him occupied. We just found out and received our Lamaze Toys and Mason and I are loving playtime together! Keep reading for a discount code! We have the Octotunes which is a musical toy that allows mason and me to have music time during playtime. It has 8 tentacles that have each its own color, textures & patterns, and when squeezed has different musical notes! This is masons by far! He loves playing with his octopus and squeezes the tentacles and making his own set of musical lyrics. This toy helps with eye development, encourages strength when pulling or squeezing, and so much more! We also got Repeat Petey, who literally repeats what you say with just a press of the wing! With fun textures, crinkles, and bright colors its sure to grab your little ones attention. This toy helps with language skills and cognitive skills as well! Mason was a little confused at first when the cute bird toy kept repeating what he said but after some getting use to, he couldn't stop purposely saying things so that it can be repeated back. There were times that we brought this in the car and mason would be laughing while playing, it was the cutest thing! It seems he made a new best friend! Last but not least we got the perfect on the go toy named, Flipping Felipe. We clip it to our diaper bag, stroller, and car seat which is great when your on the go with your child! It's a dolphin toy that by just the pull white clip, its little tail starts vibrating, great for grabbing attention. It also has a squeak and teething feature, which is truly the best feature for mason right now since he's been teething a lot lately! It helps soothe baby, helps engaged hearing, and because of the textures it has, it helps develop tactile sense! From birth and up this flipping Felipe is perfect for all ages! Lamaze toys are made for every stage of your baby's growth and even backed up by infant development experts! 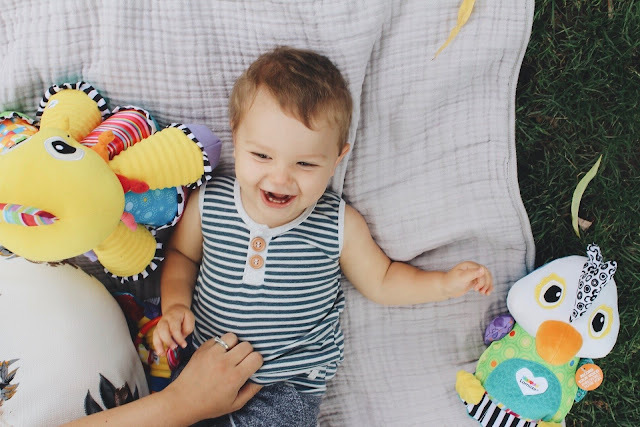 I love interacting with Mason and having educational/fun playtime together, its one my favorites things I love doing with my little guy and love seeing the memories we are creating! Mom life truly is the best life! Lamaze Information and Coupon Code!